Inspired by the varied guitar tones created in the 70's, the EMG Super 77 humbucker set brings grit and edge that responds to your playing like nothing you've heard before. With a newly designed plug-on preamp and classic open coil look, you'll get the response of a traditional humbucker with the benefit of a clean, noise free, low impedance output. This traditional design featuring ceramic magnets is available in black and zebra color options for a truly vintage presentation. The Super 77 can clean up with simple volume adjustments and soft picking, while aggressive playing and more output will produce a dirtier sound; the control is in your hands. By taking traditionally copper wound passive pickups with ceramic pole pieces and adding the new plug-on preamp, the EMG Super 77 fits any genre or style of playing. Having the look you want and versatile tone you need has never been easier than the solderless plug &amp; play Retro Active Super 77 set. Color: Black. In the Box: Package Includes EMG's exclusive Solderless Install System: 2 25k volume pot - 2 25k tone pot - 1 battery bus - 1 stereo output jack - 1 two pickup in/out bus - 2 pair mounting screws and springs - 2 pickup cables - 4 connect cables - 1 output cable - 1 battery cable. 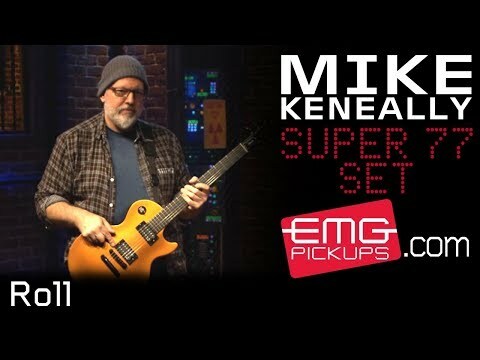 Do you own EMG Super 77 Set Black or have you had a chance to try it?